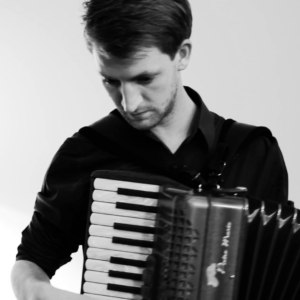 Colin Nicholson hails from Orkney and began learning the piano accordion at the age of nine. As a student of accordion aficionado, and Royal Academy of Music graduate, Ian Lowthian, Colin played in bands and taught in Orkney all his young life. After leaving school he spent a year at Stow College in Glasgow studying Traditional Music, before taking up his place at Newcastle University on the BMus Folk and Traditional Music degree course from which he graduated in summer 2012. Since graduating he has toured the UK, Ireland, Europe and Australia extensively with acts including Rob Heron and the Tea Pad Orchestra (UK) and Black Market Tune (Austria), as well as appearing live, and as a recording artist, with acts including Dogan Mehmet (Warhorse), Thea Gilmore, Rona Wilkie (BBC Young Traditional Musician of the Year 2012) Smoove and Turrell, Eliza Carthy MBE (Mercury Nominee), and The Treacherous Orchestra. In 2014 Colin won the ‚Austrian World Music Advancement Award‘ with Black Market Tune, and then in 2015 won the Spiral Earth ‚Best UK Americana Band‘ award with Rob Heron and the Tea Pad Orchestra. Notable performances include Glastonbury Festival (Avalon Stage), Woodford Folk Festival (Australia), Towersey Folk Festival, Gooikoorts (Belgium) Celtic Connections, Shetland Folk Festival and Windmills Craftworks (Bangalore, India). As an educator, Colin regularly teaches individual lessons and group sessions. He teaches privately, in schools, and regularly at residential events and workshops for organisations including Halsway Manor’s ‚Hothouse‘ Programme (Somerset), Orkney Traditional Music Project (Orkney) Folkus (Lancashire), Kirkgate Arts (Cumbria) and Yn Chruinnaght (Isle of Man).